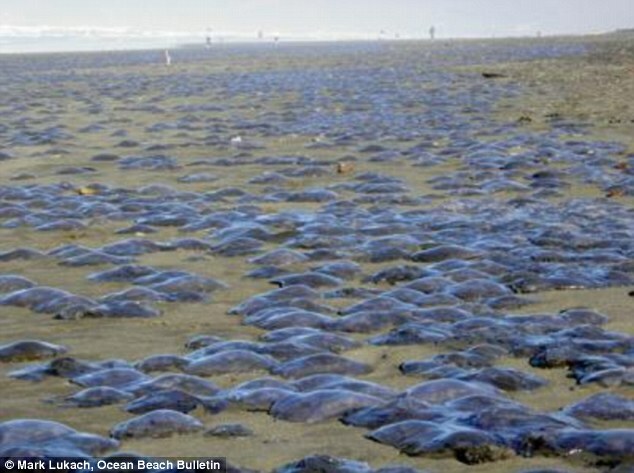 Tens of thousands of jellyfish have been found washed up on Ocean Beach, San Francisco. Jellyfish packed a section of beach stretching about three miles long and 20 feet wide. Likening the event to 'a huge, cobblestone walkway made of jellyfish' National Park Service spokesman George Durgerian said he had never seen anything quite like it before. Durgerian who reported the find to the Ocean Beach Bulletin added that the amazing sight could be seen by many San Francisco residents from Pacheco to Lawton streets. He credited the mass beaching of jellyfish to the tides. 'There was a large swell overnight that may have been responsible,' he said. 'These were jellyfish like you think they look like -- large, circular, translucent and gelatinous,' he said. The only other incident he saw involving jellyfish was about seven years ago on Ocean Beach which involved by-the-wind sailor jellyfish, also known as Valella jellyfish. 'They kind of look like a windsurfer,' Durgerian said. Durgerian said he could not explain why the event over the weekend took place adding a park service biologist would begin to analyse some of the jellyfish. He said there was no planned cleanup or rescue for the jellyfish with high tide set to take them back out to sea.